George Washington Stiles was born at Cape Breton, Nova Scotia in July of 1835. According to US census information, both of his parents were U.S. born, his father in Massachusetts and his mother in Ohio. According to the 1900 census his family returned to the U.S. in 1844. In 1857 George was living in the Boston area and on August 17 of that year, he enlisted in the U.S. Army, as a blacksmith. The 1860 census, enumerated September 5th of 1860, shows that George was stationed at Fort Defiance, in the New Mexico Territory. He probably was there to witness the Navajo attack, which occurred in April of that year. George mustered out of the Army on August 17, 1863, in Williamsburg, Virginia. He would get as far as Chicago, where he would put down roots, for a time. 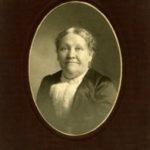 Mary Jane Cunningham was born in New York on April 1, 1840 to Edward and Mary Cunningham. Not much else is known of Mary Jane’s early life but she too went West to Chicago. George and Mary Jane were married on December 26, 1864, in Cook County Illinois. In October of 1865, their first child, a son they named George Washington Stiles, Jr. was born. 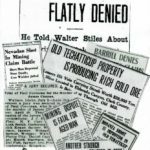 By 1870 they had moved to Will County Illinois and were living in Joliet and they had added another son Walter, to their growing family. George was working as a carpenter. George and Mary Jane, would move to Dickinson County, Kansas about 1877 and were living in Logan Township, when the 1880 US census was enumerated in June, of that year. 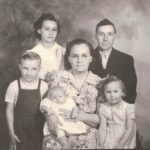 While living in Dickinson County, two of their children Mary Ida and Cora would die. Mary Ida at age five and Cora at birth, both are buried in the Belle Springs River Brethren Cemetery, in Dickinson County. 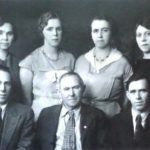 George Sr., Mary Jane and their children Walter, Albert and Emma stayed in Idaho. George homesteaded a place on Upper Fords Creek, near present day Weippe. 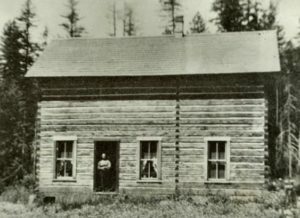 The original cabin from the property was moved in 1960, to its current location on U.S. Highway 12, in Orofino. It is now known as the Tall Pine Cabin, my Grandmother Stila (Harlan) Gleason and her siblings were born on their grandparents homestead. George W. Stiles, who died January 4, at his home on Upper Ford’s creek of jaundice, came to Moscow in 1889 from Kansas. Later his son Walt, took up a homestead near Pierce City to which the family moved in 1894. Later Mr. Stiles took a homestead on Ford’s creek on which the family resided at the time of his death. He leaves a wife, three sons and a daughter. Died:–In Orofino, Jan. 27, 1913, Mrs. Mary Stiles, age 73 years. Was buried in Orofino cemetery at 1:00 P. M. today. W. E. Stoddard, the Gifford-Orofino undertaker, came over Wednesday and went out to Fords Creek cemetery yesterday and disinterred the body of George W. Stiles and reburied it in the Orofino cemetery. 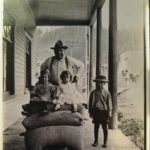 George and Mary are both now buried at Hill Cemetery, in Orofino, along with their daughter Emma, son Albert and granddaughter Stila. Their daughter Emma Caroline would marry John Paxon Harlan and many of their descendants still live in the Clearwater Valley area. 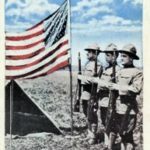 George Jr. and his wife would return to Idaho in 1909 and later relocate to Spokane, Washington, where they lived out their lives; both are buried Riverside Memorial Park. Walter and Albert would continue working in the mining industry and have very adventurous and interesting lives. Neither of them ever married.